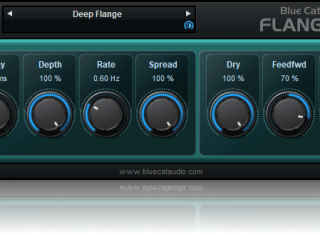 Very famous during the 70's and 80's, the Flanger effect can be used on almost any audio track: on drums, voices synths or guitars, from a subtle effect to a deep alien-like voice effect, enjoy it! 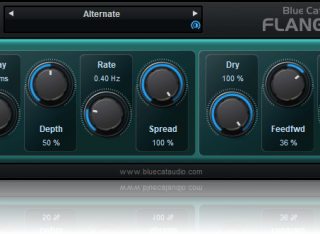 Despite its simple user interface, Blue Cat's Flanger is very versatile: harsh and metallic or smooth and soft filtering effects, it can do them all, for free! The stereo version also lets you smoothly transform it into a stereo flanging effect with a single knob. Push the "Spread" slider and hear the difference: the effect is turning around your head, and the sound takes another dimension, spread into the stereo field. The plug-in now appears in the "Modulation" category in Pro Tools. This product now includes both the mono and stereo versions. Factory presets are now available from the plugin menu. Now supports Blue Cat's Skinnning language 1.2.4. Parameters can be fine tuned when the shift key is down. Minor UI enhancement for hosts not supporting Windows XP Theme. (Bug fix): presets load/save did not always work properly in Sonar 5 for some european versions of Windows XP. Brand new skinnable Graphic User Interface using Blue Cat's skinning language v1.2.2. All parameters can now be fine tuned thanks to a text-edit popup window that appears when double clicking on user interface widgets. Feedback and Feed forward parameters can now be negative for phase inversion. Precision of the gain control enhanced. User Manual accessible from plug-in UI. Now shows version information when clicking on the logo. DX version fix: host may crash when stopping playback and effect bypassed. DX version fix: Cakewalk Sonar crashes when loading custom presets. Fixes a potential denormal issue, which could cause high CPU cost when feeding the effect with silence (15% CPU for a stereo track on an AMD 2000+, instead of 2%). GUI Improvement: now supports non-standard DPI Settings. "Rate" slider now shows 2 digits. DirectX version: smooth update and performance improvements.